Pitkin Historical and Community Association has as its mission the perpetuation of Pitkin History as well as community activities. Information which follows is primarily from the book PITKIN PAST TIMES (1879-1884), by Freeda Brown, copyright 1981 (out of print). At an elevation of 9,242 feet, twenty eight miles northeast of Gunnison on the Quartz Creek, lies Pitkin, Colorado. 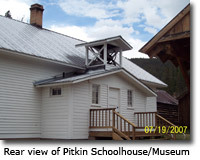 Pitkin is located on the old D & S P Railroad line in Gunnison County. The scenic Quartz Creek is formed by the junction of the North, South, and Middle Fox Creeks and winds its way through this peaceful town. Pitkin was founded by Frank Curtiss, George P. Chiles and Wayne Scott in early 1879. 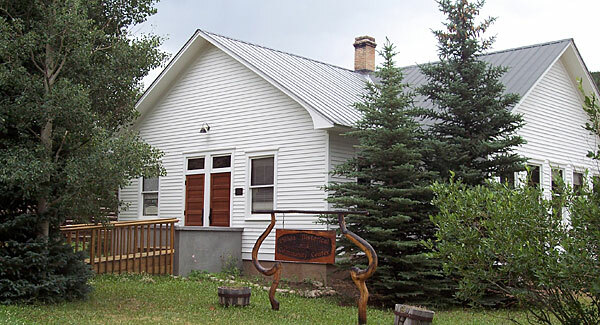 Pitkin, originally named Quartzville, was Colorado's first mining camp west of the Continental Divide. By March 1, 1879, Curtiss, Chiles and Scott, along with Zeb Watson and W. W. Wolfe began laying the foundation for the first building ever to be erected in this camp. The little log cabin was located on Main Street opposite where, In July 1880, the Pitkin Independent, the local newspaper, was established. The town, which is situated on an alpine meadow one mile long and one quarter mile wide, was incorporated on August 11, 1879, when it was renamed Pitkin after Governor Frederick W. Pitkin. Governor Pitkin was a native of Connecticut who became a prominent attorney in Milwaukee, Wisconsin, before ill health forced him to seek a new climate. After going to Europe in 1873, he became so ill that his friends believed that he would die, but he had a heroic wife who had the courage to insist that he try the remedy of the West. So the Pitkin family settled in Colorado where they roughed it among mining camps, as well as won the good fellowship of the mountaineers. Soon his good health would return. F. W. Pitkin became a man of prominence and was elected to two terms as Governor of the State of Colorado. On December 13, 1879, the first recorded lots were bought by J. M. Hill. In 1882, during the month of July, lots owned by the town went up at public auction and were sold for from $1 to $5 each. A total of 59 lots were sold for $149.65. F. W. Pitkin bought lots 7, 8, 9 and 10, Block 41, at $5 each. The first school was established in 1880 and was a private school with 39 students in 8 grades. The students met in a two-story building at the present school site. In late 1880, notice was given that the title for the town site had been received and all parties holding guarantees for warranty deeds could receive them by applying at the Recorder's Office. The prices for the deeds were $3.00 for one lot and $1.00 for each and every other lot embodied in the deed. Those deeds, many of which still exist today, were written on scraps of paper, signed by the landowner with the lot and block numbers clearly stated. Continuous discovery of mines in the vicinity brought Pitkin to life and sustained it for many years. The mineral of importance were mainly iron, lead, gold, silver, and copper, and were of such richness that as a whole they averaged higher than any camp in Colorado. Among the regular producers were the Cleopatra, Fairview, Tycoon, Nest Egg, Swiss Bill and Silver Islet mines, from which some specimens assayed $18,000 per ton. Over thirty mines operated during the winter of 1880 compared to six the year before. The first covered stage to enter Pitkin from Gunnison was on November 17, 1880. In July 1880, a toll road was being constructed from Alpine to Pitkin and would be kept open all winter. The first church service was held in December of 1880 when the Episcopal Mission held services in the City Hall. By 1881, churches included Presbyterian, Union Sabbath and Congregational Churches. The first telegraph was put into operation in September 1880 and was housed in the Pitkin House Hotel. C. W. Sanborn started a sawmill six miles above Pitkin in March 1881 where he reportedly had over 500,000 logs ready to be cut into lumber. Many social events and organizations cropped up in Pitkin due to Pitkin's growing population. On March 1, 1881, "J. L. Sanderson & Company" began running their stage lines along the toll road from Gunnison through Pitkin, up Middle Quartz to Woodstock, over Williams Pass to Hancock and beyond. Sanderson & Co. also added to their lines two new six-horse Concord coaches to handle the immense travel to Pitkin. Sleighs were then put on runs between Alpine and Gunnison during the winter months. By July 1881 newcomers were pouring into Pitkin at the rate of 25 per day. Then a complaint was lodged against the stage company because passengers arriving by stage were not allowed to stop where they would like to. Company officials changed the schedule to accommodate the new pioneers. The stage began leaving for Alpine at nine o'clock instead of at three in the morning, arriving about four in the afternoon along with he Eastern mail. This stage stopped at the Post Office on the corner of 5th and Main. A stage fare from Gunnison to Pitkin, a distance of 28 miles, was Four Dollars. In 1881 Governor Pitkin, along with his wife and two children, Robert and Florence, arrived in this camp by stage via Woodstock. They were guests at the "Pitkin House" for a week before traveling on to Ouray. By June of 1882 there were over 60 business houses and 300-400 residences, with fewer than a dozen of them empty. It had a population of over 1,000 and the surrounding hills were bursting. As a result of the rapid growth, property values rose accordingly. One early settler purchased 10 lots for $10 in 1879 and sold them in 1880 for a profit of $5,0-00, a considerable sum for that time. The early promise began to fade by the summer of 1882. Mineral veins that were rich near the surface began to play out at over 75-100 feet in depth, and didn't justify further development. By the spring of 1883, Pitkin had lost half its population. During the late 1880's three major fires and three epidemics also contributed to Pitkin's decline. A short revival in silver mining took place in 1891 and 1892, but ended with the silver panic of 1893. The Roosevelt Mine three miles below Pitkin opened in 1907 with a great deal of promise, and operated into the 1930's. But low grade ore and controversy stopped its operation. In the 1920's and 30's the timber industry and the fish hatchery helped to keep Pitkin alive. The depression of the 1930's caused further reductions in population to below 100, where it has remained. During the Winter of 1997-1998 Pitkin had 80 year-round residents, but summertime brings the count up to between 200 and 300 residents. Enjoy Pitkin! Visit http://www.marmotpress.org for more Pitkin history.